How should you ski together if your kids are different ages and ability levels? We all know that kids go through stages of development and do so rapidly. When siblings are born several years apart, it's only natural for them to have differences in how they process information, how they can move their bodies, and how they feel. When siblings play sports requiring thinking and coordination, one of the two can be disappointed with his or her performance, while the other has a good chance of getting frustrated or bored. From teaching snow sports, I know the ideal is to teach a group of kids who are all close to the same level. With a well matched group, the lesson has a great chance of being fast-paced and fun for everyone, from start to finish. But you and your spouse live in a country which allows you to have multiple children, and you want to ski as a family. And if you didn't have twins, it's likely that you'll be skiing in a group of disparate ability levels. Have everyone take a lesson on the first day of your ski trip. If possible, arrange for a private lesson for your youngest, or lowest level skier. The attention of a private lesson will produce the most skill development in the shortest amount of time. When skiing as a family, ski only on terrain suitable for your lowest level child. And if what your 7-12 year old children can ski scares you or your spouse, consider putting them in all-day group lessons and confining family ski time to warm up runs on gentle terrain before their lesson starts. Have a plan and communicate clearly during every run. "Gang, we're going to ski down Washoe, a blue run. I'm going to go first, and stop by the yellow snow gun halfway down. Let's meet there. If we get separated, let's meet at the bottom of the trail, by the Martis Camp Lift. " Have your more advanced children serve as "Captain Safety" when you're skiing together. Their job? Skiing at the tail end of your group, shouting "Wipe-Out!" if someone falls, and stopping to help retrieve skis or more equipment if it was a total yard-sale. Allow them to wait for everyone to ski down to a pre-arranged meeting spot before skiing themselves, so they can show off their prowess to an appreciative audience. Ask your youngest child to teach you whatever ski games they played in their lessons. Level 1 kids often learn Red Light/Green Light, and playing this with Mom and Dad helps develop a nomenclature for getting them to stop when it's imperative. Ski behind your child telling them what to do, what not to do and where and when to turn. (red light/green light is an exception). Get frustrated by their upper body movement or arm position. Kids' arms and legs are wired together; often making a triangle with the skis is paired with flared elbows and seemingly wacky hand positions. Ski with a toddler between your legs. You are heavy, you're not Jean Claude Killy and even the best ski instructors refrain from this highly dangerous practice. Now that the heavy part is over, here's a fun video shot on November 20th, the 2nd day of the season after a great big storm. 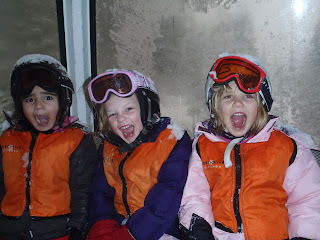 In it, I'm skiing with Lily and Sophie Keegan, siblings separated by more than two years. Parents, Click here to visit this week's Lesson Album to download photos. 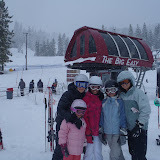 This past week was my first full week of teaching skiing for the 2010/2011 season. Classes ran the entire range - Superstar kids (aged 4-6), Adult first-timers, and several fun private lessons. Someone put a ton of quarters into the snow machine, as so far this season, a total of 119 inches has fallen at Northstar. More snow is on the way this weekend, and according to the Northstar Weather Discussion Blog, we could see some storms in the next two weeks which make last week's seem small. So get your skis waxed and make your travel plans. As always, I'm available for suggestions as to where to stay, eat or ski, even if you're heading somewhere other than Northstar. Please do share the the album link above with your friends on Facebook, and stay tuned for an edited video compilation. Signing up for email notifications on This Mountain Life will alert you when new media and skiing tips are posted. The National Weather Service is calling for 2-4 feet of snow above 7,500 feet this weekend! I can't wait for the season to start. My first lesson of the year is a private lesson for my good friend April's young daughters, Maria and Elizabeth. They're coming up on Monday of Thanksgiving week, and Mom and Dad are psyched to drop off the kids, and enjoy some free time while the girls and I tear up the mountain. While we've been waiting for the snow to fall this week, my housemates and I have been reviewing a bunch of video we shot during various lessons last season. All of our students are special, and Chloe is no exception. She was a bit shy and reserved until the camera came out, and voila... she was transformed into a hard charging, "let's go faster" little skier, and the smile count started climbing exponentially. The lesson here for parents is that the focus should never be how well a child skis, or how quickly they are growing their skills. Skiing is all about having fun. Once a child is enjoying him or herself, learning comes naturally, confidence builds, and the little one will be leaving you in his or her dust.